Drew Bledsoe will be the newest member of the New England Patriots Hall of Fame! It’s easy to remember the way Drew Bledsoe left the New England Patriots. It’s very easy to remember the hit by Mo Lewis, the internal bleeding, the recovery, and the benching. It’s easy to remember Tom Brady leading the charge, becoming “The Man,” leading the blue and silver to playoff glory. We all recall Bledsoe coming off the bench when Brady sprained his ankle in the AFC Championship Game, his performance in the first half that paced the team’s victory, and the tears when he collapsed with the game ball after that game. And it’s easy to remember how Drew faded into the sunset as Brady won the Super Bowl, became the NFL’s Golden Child, and exiled Bledsoe to the twilight of his career. After a brief resurgence in Buffalo, Bledsoe faded out of sight, replaced first by JP Losman, then again in Dallas by Tony Romo. On Monday, Bledsoe became the latest member elected to the New England Patriots’ Hall of Fame; the latest of the line of players who helped paved the “Patriot Way” that’s become a staple of fan lingo over the last decade. He was the first true Patriot, the biggest and brightest star, and Pats fans always keep a special place in their hearts for #11. So the New England Patriots (9-2) and New York Jets (9-2) will meet on Monday Night Football on December 6, but this game is BIG… SO BIG! With so much excitement already in the air for this particular game, here is a look at some of their great games or moments against one another throughout the NFL history. 1.) 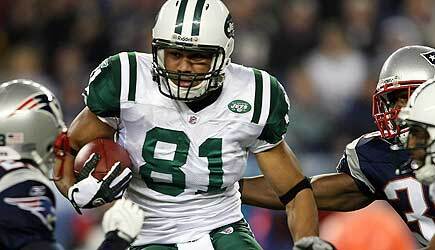 In week two of the 2010 season, former Patriots wide receiver, Randy Moss and now, Tennessee Titan, made a true highlight reel catch against the Jets, but despite the acrobatics in the end zone, they earned their first loss on the new season, 28-14. 2.) In week two of the 2009 season, Jets head coach Rex Ryan and rookie quarterback Mark Sanchez earned their first win against Tom Brady and Bill Belichick, as well as the rest of the New England Patriots at Giants Stadium, 16-9. 3.) In 2008, the Patriots were without Tom Brady, but an emerging star by the name of Matt Cassel took his place following a week one season ending injury against the Kansas City Chiefs. After beating the Jets on the road earlier in the season, their Thursday night showdown against Brett Favre and head coach Eric Mangini became an instant classic, as the men dressed in green and white escaped with an overtime field goal. Favre used his Green Bay Packer magic en route to another Jets victory against the Patriots. 4.) On September 9, 2007, Patriots cornerback, Ellis Hobbs, returned a Mike Nugent kickoff return for 108-yards, which broke a record for the longest return in NFL history. The Patriots would not look back following Hobb’s touchdown and go onto beat the Jets at Giant Stadium, 38-14. This win marked the first of 18, as well as the final days of “Spy-Gate,” for coach Belichick. 5.) The Patriots had already won two Super Bowls and were pursuing another in 2004. Already, the Patriots had won 20-straight games in a row, but against the undefeated Jets on October 24, the Patriots secured their 21st straight victory by beating their rival, 13-7. The Patriots defense came up with a gigantic stop in the fourth quarter to earn the win and advance to (6-0) on the season. 6.) The Patriots-Jets rivalry rarely has any sideline buzz, but in December of 2003, former Jets quarterback and Super Bowl III MVP, Joe Namath stood on the sidelines of Giants Stadium, drunk, incoherent and expressed that he wanted to kiss ESPN sideline reporter, Suzy Kolber. While Namath made a fool of himself on national television, his former team continued their losing ways, as the Patriots swept the season series by defeating the men dressed in green and white by a score of 21-16. 7.) This may not be considered a great moment for every Patriots fan, but in week three of the 2001 season, Jets linebacker Mo Lewis changed the fate of the 2001 campaign for both teams, as well as the decade too. Patriot quarterback Drew Bledsoe rolled out of the pocket in the fourth quarter and started to run down the sidelines, but Lewis blindsided the gun-slinger and sent his opponent flying out of bounds. With Bledsoe down for the count, this opened the door for Tom Brady and paved the way for the Patriots to become the newest dynasty in the NFL. 8.) In his first Patriots game as head coach of the Jets, Bill Parcells‘s men fell short to Pete Carroll‘s squad in 1997, as New England knocked off New York, 27-24 in overtime. 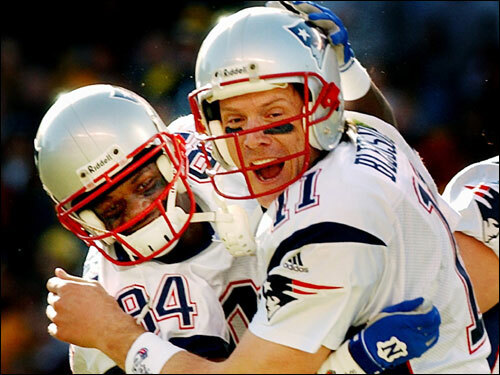 Quarterback Drew Bledsoe threw for two touchdown passes and running back Curtis Martin earned 199 yards and a touchdown on 40 carries in the victory. Parcells though would get revenge against his former team a few weeks later at Giants Stadium, when his team beat the Patriots, 24-19. While these maybe more of the recent memories that stick out between the Patriots and Jets, what are some of the other ones you remember? Send us an email (NoontimeSports@gmail.com) or tweet us on Twitter (@NoontimeSports).